The Warwick Centre for the History of Medicine is delighted to announce a new public engagement collaboration with Talking Birds linked to Professor Hilary Marland’s research entitled: ‘Trade in Lunacy’, supported by the Wellcome Trust’s Centre Strategic Award; Situating Medicine: New Directions in the History of Medicine and Arts Council, England. 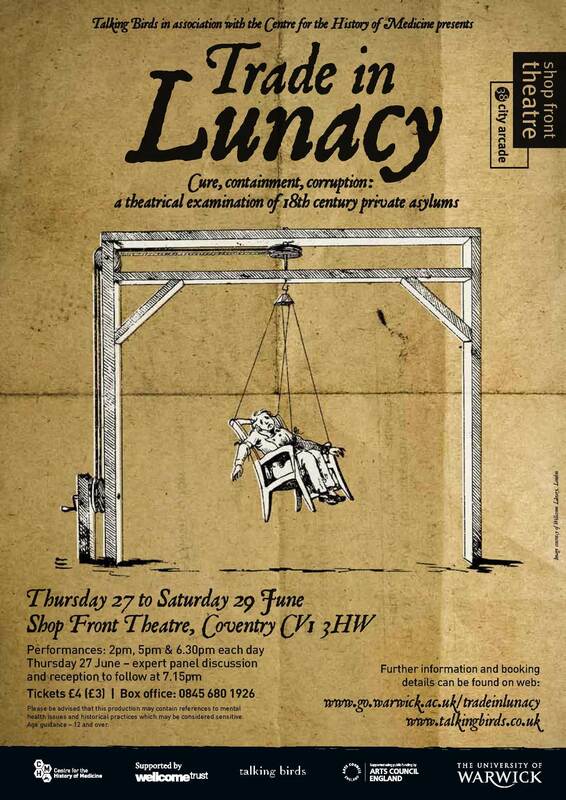 The Trade in Lunacy is a chamber theatre performance inspired by the practices of treating those diagnosed with ‘diseases of the mind’ in private houses set up by individual entrepreneurs to generate income and enhance claims to cure. Further details and booking information is available via the webpage.